To get more specific, here are our top picks for the best rowing machines. You can click through for more in-depth rowing machine reviews. The other nice thing about the Concept2 Model D’s PM5 monitor is that is calculates drag factor. This means that you get a true measure of your workout effort no matter if any other factors change such as damper resistance adjustments or a stiff breeze comes through your workout room (not likely). There’s a reason CrossFit enthusiasts choose the Concept 2 Model D – it’s a work horse. Click here to read the full review. 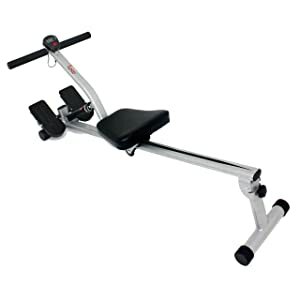 The Stamina ATS Air Rower is an example getting a ton of value for a low-priced rowing machine. This rower features wind resistance which creates a very smooth workout. And that’s just the beginning. Featuring the ability to fold and with its attached roller wheels, the Stamina Air Rower is very portable and stores easily in a closet. The Air Rower includes a monitor that provides speed, stroke count, time elapsed, and calorie count. With a sturdy steel and aluminum frame and solid construction, the Stamina ATS Air Rower comes in at a very reasonable price and is very easy to assemble in around 15 min. Click here to read the full review. A nice feature is the included heart-rate monitor strap that allows you to see your pulse during intense cardio workouts. Each type of resistance has its benefits and unique rowing feel, so be sure to take that into consideration. The best rowers will have a comfortable seat, good foot pads, and some adjustability. You’re going to need a good amount of dedicated floor space in your home to comfortably and safely place your rowing machine. Rower length varies, and they are usually rather narrow, but almost all have long footprints. 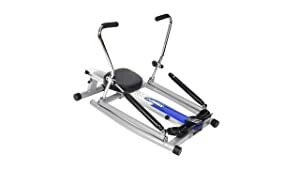 As with most pieces of exercise equipment, you’re going to find that the price will vary widely between the budget level and the high end row machines. Higher priced models are made to take a lot of use and last a long time, while cheaper models can get you working out now if you’re on a budget but may need more maintenance or replacement sooner. Rowing machines can usually handle higher weight than most other exercise machines. There are less moving parts to become stressed by heavier users. Most good rowing machines come with a handy computer that tells you information such as distance, time, and calories burned. Additionally, check to see if the rower you’re looking at has the option to connect to apps so you can upload data and be able to track your progress. You might only have to assemble your row machine one time, but you want that one time to not be a total nightmare. Do your due diligence and make sure you’re not getting some crazy puzzle instead of a piece of exercise equipment. As always, you’re going to want a decent warranty that covers parts and frame. Rowing is a great cardiovascular workout as well as a way to strengthen most major muscle groups of the body. It’s a low-impact exercise that can be just as challenging as any higher impact exercise. It burns calories and tones the body which, in conjunction with a healthy diet, can help you lose weight. Not only does rowing allow you to improve your cardiovascular fitness and build muscle, but when you put those together, you’ve just found yourself on the path to healthy weight loss. If shedding pounds of excess fat is your goal, a rower is a great tool to help you get there. The beauty of a rowing machine HIIT is it offers an optimal workout in a minimal amount of time. It may sound too good to be true but you can really make a huge difference to your overall fitness in just 20-30 minutes. Give this rowing machine HIIT sprints workout a try if you’re looking for a good fat burning workout. Remember to start off every workout with a 5-10 minute warm up and cool down. This workout will take a total of 26 minutes (not including the warm up or cool down). Good posture and correct form while rowing are key to getting the best workout as well as avoiding injury. Start with a low resistance level to make sure you’re comfortable, then increase resistance as needed. Sit on the seat and secure your feet on the pads. For the “catch”, keep the back very straight with arms extended while holding the bar or handles of the rower. For the “drive” phase, push off in a controlled motion, powering through your heels into the pads and straightening your legs. Pull the cable toward your chest, but don’t worry about pulling it all the way in. At the “finish”, your legs are fully extended, shoulders back, and the bar pulled near the upper chest with wrists straight, not curled. On the return or “recovery”, allow your arms to straighten and your knees to bend. The recovery is where your core muscles such as abs and lower back can get a good, safe workout so keep them engaged. You don’t want to be rowing without shoes on. It’s plain dangerous. And, of course, this goes for any kind of workout on an exercise machine. It can be sneakers, running shoes, or cross-trainers. Just make sure you’re protecting your feet. Flip flops and high-heels are not advised. Think closed-toe, rubber bottoms, shoes. When starting your search for a rowing machine, you’re likely to be at a bit of a loss as to which way to go and which type rower to buy. 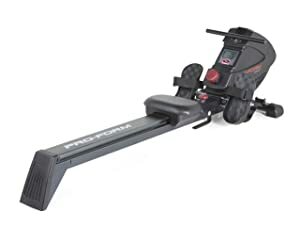 But even if you’re well under way in your hunt, we hope this review helped you understand the wonderful world of rowing machines a little more clearly. Overall, the most important thing is to get on a rowing machine and get rowing. The best rowing machine is the one that fits in your budget and fits your body. Your heart, muscles, and mind will thank you! what a informative article. really helpful for the beginners. thanks. Very informative article, just what I was looking for. Best article I’ve seen about rowers. Thank You very much. Thank you that really helped in our decision making , very informative article , highly recommend to anyone considering a rowing machine . You say above that rowing barefoot is dangerous. What is the danger? Thanks for your question. It’s just a good idea when operating any kind of machinery to protect your feet. And it’s actually going to feel better in the long run to have shoes on since you’re going to be pulling on the foot straps during the rowing action.